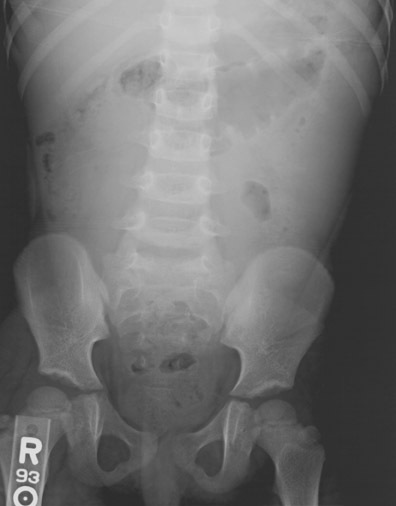 An abdominal radiograph was initially obtained and raised suspicion for a possible intussusception (Figure 1). 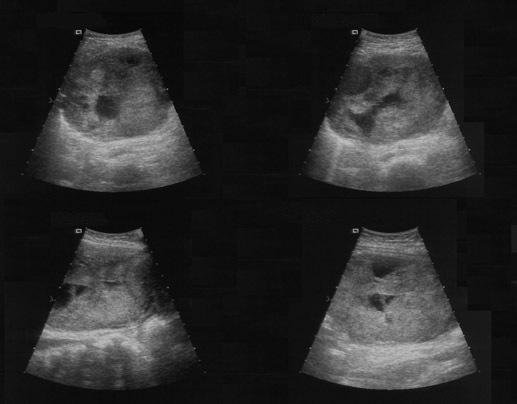 A subsequent abdominalultrasound found a large complex low anteriorabdominal mass abutting the uterine fundus measuring 10 × 6.6 × 9.3 cm (Figure 2). Laboratory analysis revealed a dramatically elevated serum estradiol level. Axial computed tomography (CT) of the abdomen and pelvis was performed following the administration of oral and intravenous contrast material. The enhancing mass demonstrated both solid and cystic components. There was free fluid within the abdomen and pelvis, but no lymphadenopathy. Prominent subareolar breast tissue was noted on images through the lower chest. Based upon these findings, the patient underwent laparotomy for tumor resection and unilateral salpingo-oophorectomy. Among the histologic subtypes of granulosa cell tumors, juvenile granulosa cell tumors are rare, and typically present early. In a study of 125 patients with juvenile granulosa cell tumors, 78% presented within the first 2 decades of life.3Clinically, these patients typically presentwith signs of hyperestrogenism—precocious puberty in pre- pubertal patients, menstrual irregularities in women of reproductive age, and abnormal uterine bleeding in postmenopausal women.3 In addition, patients may complain of abdominal pain or an abdominal mass. Juvenile granulosa cell tumors of the ovary represent a small fraction of all primary ovarian malignancies. They typically present within the first 2 decades of life with signs of hyperestrogenism, and an abdominal mass. 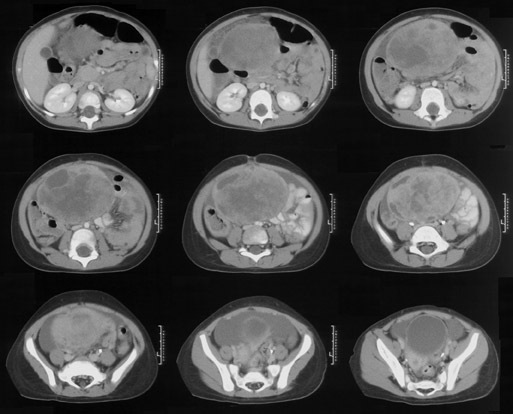 As the majority of these tumors are diagnosed atstage I, their treatment remains surgical. The role of chemotherapy and/or radiation therapy remains unclear. Given the possibility for recurrence, long-term follow-up and surveillance is recommended for all patients. Funt SA, Hann LE. Detection and characterization of adnexal masses. Radiol Clin North Am. 2002;40:591-608. McCluggage WG. Recent advances in immunohistochemistry in the diagnosis of ovarian neoplasms. J Clin Pathol. 2000;53:327-334. Young RH, Dickersin GR, Scully RE. Juvenile granulosa cell tumor of the ovary. A clinicopathological analysis of 125 cases. Am J Surg Pathol. 1984;8:575-596. Schumer ST, Cannistra SA. Granulosa cell tumor of the ovary. J Clin Oncol. 2003;21:1180-1189. Lack EE, Perez-Atayde AR, Murthy AS, et al. Granulosa theca cell tumors in premenarchal girls: A clinical and pathologic study of ten cases. Cancer. 1981;48:1846-1854. Juvenile granulosa cell tumor of the ovary. Appl Radiol.